It is very easy to turn to and get fouled up by self-scrutiny in our approach to God. “Is my motive pure? Am I seeking Him for what He does or for who He is? Why am I reading my Bible or praying? Am I trying to get favor with God? Am I doing it right? What if I’m doing it wrong? Oh, I’m such a puzzle!” Frankly, these kinds of questions often tangle me up in the sometimes hidden pursuit of self-righteousness with God. That never goes well—my history shows it. Maybe yours does, too. I have found Him to be perfect with me, so I now care less about why I’m approaching Him and what my motive might be in the deep and dark recesses of my mind than I once did. I care far more about knowing and enjoying Him in any condition I might encounter. While I sometimes discover that rickety Ralph has been tripped up by fleshly demands that God be more obvious, more helpful, more useful, or more like Santa Claus than He evidently is to me, He fixes all of that craziness in me. He cleans up the mess! He is good with me (and with you), and I find all over again that He is the solution—The Solver—of all that confuses and harasses me, Mr. Puzzle; pure motives or bad, honorable intentions or not, doing it right or doing it wrong. While it is a powerful temptation, the flesh that plagues me cannot be solved by me. That fact makes room for my sometimes reckless and rickety approaches to God, who then emerges in me as The Righteous One, The Rescuer, The Victor and The Solver of the lifelong puzzle that is Ralph Harris. Maybe you’re that puzzle for God to solve, too. He doesn’t mind. 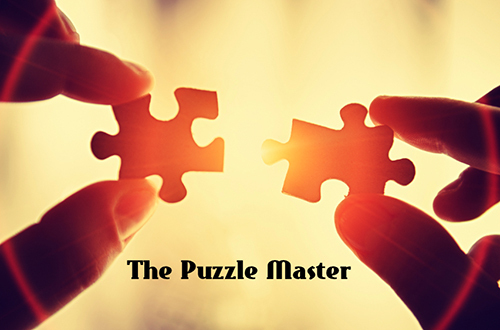 He’s The Puzzle Master, and He’s good with bringing you together—especially when you know you cannot. Right then. During those times when your puzzle pieces are scattered all over the place, and the picture, the puzzle box top of how you should look and how you should be is condemning and eluding you, those times actually keep you to the free and fabulous effort of God in you—the Spirit of grace. Those crazy times keep you from believing the lie that you’re supposed to have this all figured out: “Move your own pieces into place, for God’s sake!” That’s just not true. Galatians 5:4 You who are trying to be justified by the law have been alienated from Christ; you have fallen away from grace. 5 For through the Spirit we eagerly await by faith the righteousness for which we hope. I know that I eagerly wait sometimes, don’t you? Well, that’s a good thing! If just now you’re a puzzle box of craziness, don’t worry about how to do anything properly with God. Simply tell Him what you’re thinking and feeling, however reckless, rickety and ugly it might sound. He’ll put you together because He knows the fit. He’s great at it because He’s your Puzzle Master.